These photos were taken at a photo session with Alianor and her adorable daughter Delia. I brought balloons to match her outfit and we all had a great time playing around with them. If you missed the original post, you can see the photos here and here. 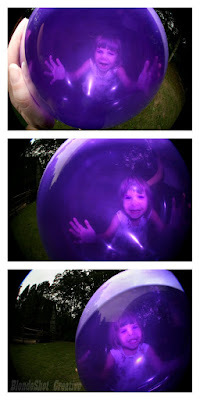 At one point Delia took this purple balloon and started smushing her face into it & making silly faces. It was so funny I don't know how I got photos while laughing so hard.